Last week I was going through Flipboard when I came across an article about LinkedIn privacy. I knew I’d set up my site to protect some of my information, but I never thought much about the advertisements that show up now. That’s because I got on LinkedIn in 2006, back before they were trying to be Facebook, and they didn’t have advertisements. Now they have advertisements along with the newsfeed, something else they didn’t have a long time ago, and track a lot of other information that I hadn’t thought of. This encouraged me to go into the settings to see what I might have missed, what’s new and what I wanted to change. 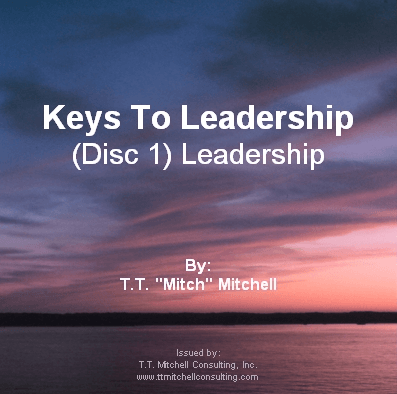 I figured this is as good a time as any to share with you what’s going on, how I set my account up, why I did it the way I did, and give you the chance to go into your LinkedIn account to see where you stand. This post is going to look different than my norm since there’s going to be a lot of screenshots. It starts with the one above, which shows my image profile. Where we want to go is in Settings and Privacy. Next, you’ll see this menu. Obviously we’re going into Login and security. The other four lines I’m skipping because none of them are necessarily about security or advertising; if you decide to get into it later on you’ll see what’s there and determine if it’s what you want to deal with. Below this paragraph is what you’ll see at the top. We’ll be looking at the first 3 things. Communications is basically you deciding if and how you want LinkedIn to communicate with you. That really doesn’t concern privacy, just preference. Below this is the first place where you get to start making decisions. 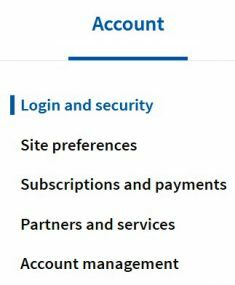 The first thing you get to do is set which email address you want to use and how many. Back in the day I only had my main business email address on here, but a few years later, when there was a problem with LinkedIn, I decided to add a second email address. You don’t have to do this but I felt like the smart thing to do for me. Next is where you can leave a phone number. Although I’m not generally hiding my phone number, I decided I didn’t want to give it to LinkedIn. My general preference is that if someone wants to connect with me by phone, they can visit my website, where my phone number is on every page. Occasionally LinkedIn sends messages asking for your smartphone number in case they need to verify something. Since I rarely give anyone that number, they weren’t getting it! lol The last thing here is where you can change your password; that’s pretty standard. Here’s the first image that’s going to kill my mobile friendliness, but you need to see it. You see how LinkedIn can track you. In this image, you see the information they have on me at the time I was signed in to the privacy settings. They’re not showing anything all that specific, yet it’s illuminating. There’s nothing you can do for this; it’s their right while you’re on their site to know where you are (I’m not sure if the premium version is different). This one is intriguing. 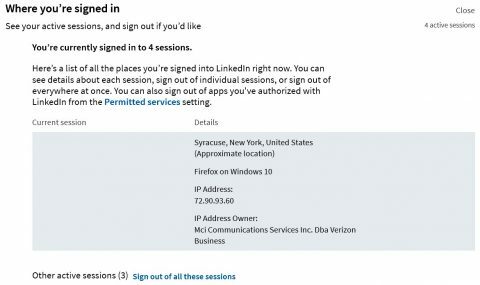 It shows 3 other times and places where I signed onto LinkedIn, so to speak. The two recent were from my smartphone, which it knows is an Android. The other shows I signed on from Chrome… 25 days ago! I don’t even remember doing that; I’m rarely on LinkedIn via Chrome. I could sign out of these but I’m not going to do it because I’d have to sign in if I used these again… and since I check into LinkedIn at least once a day from my phone I’d rather not keep signing in. However, it’s a safety feature you might want to do if you’re worried about some of your privacy. There’s one more thing I didn’t show you, that being the two-step verification. I always find that kind of thing irritating so I’ve never done it. However, if you’ve given access to a lot of your information, people could add you to their newsletters and mailing lists. The two-step verification will protect you from that, as well as protect your account in case someone tries to hack you. This is another reason to create tough passwords so it’ll be something you shouldn’t have to worry about all that often. Now we’re under the privacy setting. I’ve broken this one in pieces since there are multiple options under this tab to consider. The first one allows you to change how people see your profile based on where they’re coming from. I have mine set so that if someone’s pulling up the link from a search engine they get the minimal version of the site, and if they’re on LinkedIn they get the full profile… which has a lot on it. The next one gives you the option of deciding who to allow to see who you’re connected to. Most people don’t care what you see; I’m a bit different. Since almost everyone I end up being connected to connects with me first (unless I know someone really well who I’ve just discovered is on LinkedIn), I get to check them out to see who we’re both connected to but they don’t get to do it the other way. This is how I get to be discriminating in who I add or not; you can set yours up your way. The last one is something that irritates me about LinkedIn. Personally, I don’t care what other profiles someone has viewed that’s viewed me. Since I don’t care to see it, I don’t allow anyone else to do it if they’re checking out my profile. Long time readers know that much about it; I won’t do something I don’t want others doing. Next is whether or not you want your account to be associated with your employer in any way. Some people would rather not make it that easy, in case they’re looking for another job elsewhere. Since I’m self employed I left it alone. 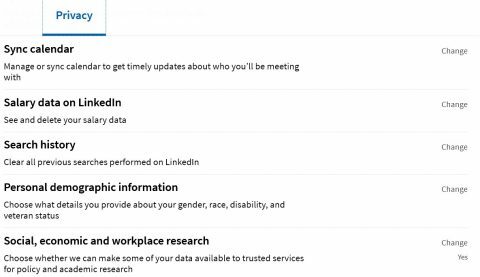 The next two allows you to determine if you want to let LinkedIn cater some of your information to other people using some of the services you might be using. They give the example of people who have an Outlook email account. I turned this baby off; I don’t need LinkedIn promoting me that way to anyone. The last one I just changed because I hadn’t noticed I had it saying yes; since I’m not looking for a job I don’t need it active. 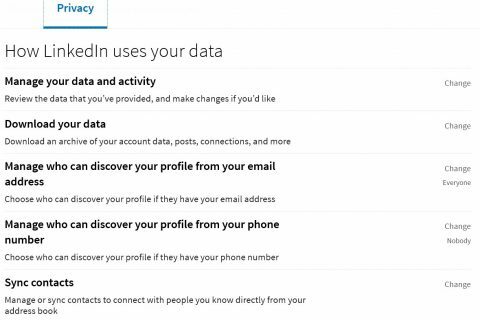 This next series allows you to determine whether people can see your full profile, a partial profile or make yourself anonymous through your LinkedIn account. As you can see, the only thing I’ve hidden is if I’m on LinkedIn at the time someone is viewing either my profile or my articles. Since I put a lot of articles and videos on LinkedIn, my version of advertising, I want people interested in what I do to find me. You might not want to be as visible; check these settings. This is a long section so let’s zip through it. The first link gives you all their updated policies and changes going back through the years. 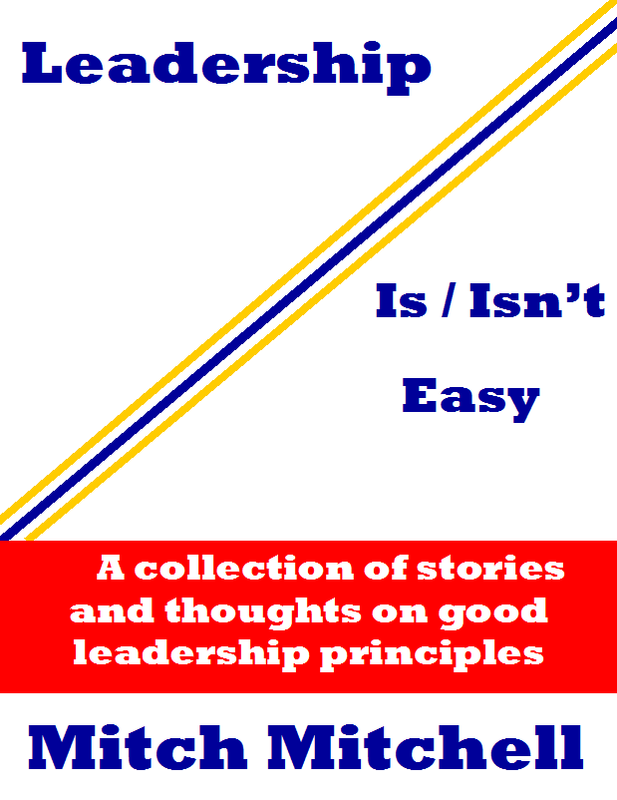 You can read them if you’d like and decide to make changes based on what you read. The second one gives you the opportunity to download everything you’ve ever done on the site. For someone like me, that would be a monster file. Frankly, I’m not that interested, but you might be. The third one might seem counter to my normal privacy settings. My thought is that anyone who has my business email address already might as well be able to look me up on LinkedIn; I have nothing to hide from someone who I’ve either already connected to or someone who put in a modicum of work in finding that email address. The fourth one is definitely me, especially since phone numbers are easily found by marketers. The last one here… I don’t want to allow LinkedIn to use my contact list to find people I’m not connected to; I can do that for myself, thank you very much! Since I’m self employed, I’m skipping the job preferences section; you can check that one on your own. 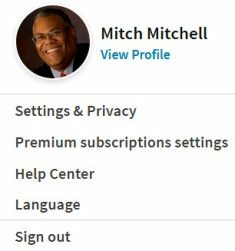 🙂 I’m allowing anyone who wants to see my posts and articles to follow me on LinkedIn. I have way more followers that people I’m connected to, which is something I prefer. The last two allows you to see who’ve you’ve blocked or unfollowed, and to change your mind if you’re interested. The last section I’m going to talk about is the Ad section, and I’m not sharing any images. The reason why is because I’ve said “no” to everything on that page. Basically I’ve said that I know they’re going to feed ads to me, but I don’t want them using any of my information, tracking where I go, sending me stuff my connections might like… whatever they’re thinking about sending me based on anything, I don’t want to play the game. I still get ads but they’re fairly generic. I don’t mind that so much since it was more important to me to not be tracked (I’ve done the same thing to Google). That’s about as comprehensive as it can get without bogging down this article. 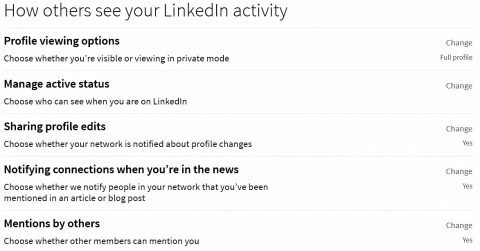 If you’re on LinkedIn, I recommend you check your settings so you know what you’re getting and why. Protect youself; protect your information. 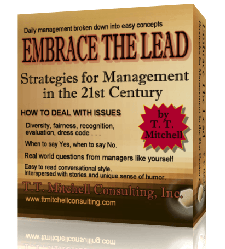 I just started using LinkedIn for promoting my blog, so I really found this article helpful. It is imperative to know I am getting and why. As long as you only show or receive what you wish then you can proceed well on LinkedIn. Hi Mitch, wow, you really covered this one completely. I hadn’t looked at mine in some time – the settings. 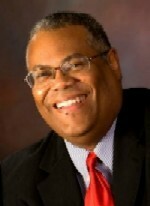 I do use the site daily and with my Android mobile device too so this was an eye opener! Thank you Mitch for sharing and I will be adjusting some of my settings as well. Glad to share Lisa. I tend to believe a lot of people complain about things without taking the time to check out their settings and at least try to protect themselves. I hope the images along with my explanations helps a lot of people get it right.